I played with the macro function on the iPhone this week and had some fun. I discovered my favorite app, Camera+, does a nice job on macro as well as traditional imaging. This photo was edited using only the Camera+ Clarity filter. 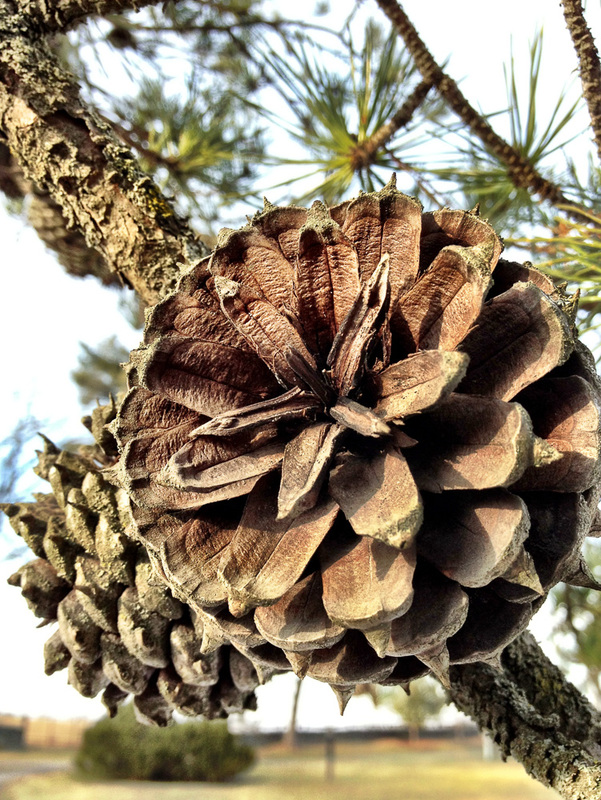 The impressive pine cone, about the size of your fist, has great texture and was found on the Table Mountain Pine (Pinus pungens), which is one of the many types of pines at the State Arboretum of Virginia. Amazing! I love your new blog theme! Terrific entry–i’m going to place your link on my post for the iPhoneography Challenge from today. Thank you, Sally! I appreciate you all hosting the challenge. I really enjoy my iPhone and now I have a day set aside to focus on using it. That is amazing how well this macro image turned out. I never would have tried, now I will thanks to you. My son actually received an honorable mention last year in a pretty prestigious photo contest using my iPhone for a macro shot of a flower. I was amazed, too! Quite a nifty little camera to have in your pocket all of the time! I could feel it right through my screen. Wow. Please change this on your website. Hi Chloe. You might need to sign up again with this new email. I don’t see a place where I can change it on my end. Thanks! Thanks, Polly! Love the Camera+ app. I think that helps the iPhone get a bit more detail.